Eppure si muove…or does it? Just got an email reminder from the ICPSR data archive yesterday that the 2006 GSS data are out and ready to play with. Always curious to know what’s happening with my favorite survey of the attitudes and behaviors of the American population I looked around the codebook to see what was new for 2006. Among the highlights, there is (1) a module designed to estimate global characteristics of the social networks of the American population using a cutting edge method based on asking people questions of the type: “How many people do you know…(named Jeff, in Prison, who can do a somersault, who eat hamburgers, etc. [see Zheng et al 2006] and see also a copy of the proposal of the GSS module designed to measure “network polarization” in the American population in order to see if it is related to “cultural polarization”) and (2) a “science” module designed to measure the scientific knowledge of the American population. My guess is that (1) will produce the most fascinating and scientifically interesting results, and (2) will of course provide fodder for the constant complaints (and jokes) about the utter mental dullness of the population. Now, does the Earth go around the Sun, or does the Sun go around the Earth? How long does it take for the Earth to go around the Sun: one day, one month, or one year? Barring that guy who categorically refused to answer the question, we are again faced with the result that a full one-fifth of those in the American population who are aware that the earth revolves around the sun are in their turn unable to distinguish the earth’s rotation around its axis from a full revolution around the sun. Poor Galileo; talk about reason to turn in your grave. Posted in networks, omar, research, what does this have to do w/ org theory? You and the GSS folks just made me more cynical than I already was. Thanks. IQ is useless, yada yada, but still I’d be interested to see the correlation between IQ or some reasonable proxy, and anti-Galilean belief. Who said that IQ is useless? Logit regression says that an error-ridden facsimile is still a reasonable predictor. This is hard to believe. I might download this data also and play with it more. We’ll see if your faith in the networks data being the larger contribution is borne out. Jeremy, unfortunately true apparently. BTW, the predicted probabilities used to construct the graph above made possible by Long and Freese’s spostado utility for Stata via the postgr3 wrapper. Thanks! Depends on your view. Obviously the earth goes around the sun, from the larger perspective, in outer space or from the perspective of the sun. From the perspective of someone on earth (because the earth is spinning on an axis), however, it is also true that the sun goes around the earth. If you don’t believe that, check what happens each morning, afternoon, evening, and next morning. What’s that matter with everyone? Just because 18% said sun goes around the sun doesn’t mean the all (or even most) were not aware that it’s also true the other way around. Some or most (conceivably, almost all) may have figured the question was so simple (didn’t see the whole set of questions so I don’t know) that there was a trick, or wanted to toss in a monkey wrench. Both are true. Actually, the Sun revolving around the Earth is not the same as the Earth rotating about it’s axis with a “static” Sun. A simple analysis of centripetal forces reveals the difference. Just as in the Relativistic “Twin Paradox”, the younger one can be clearly identified as the one who accelerated and deccelerated to those velocities (According to your logic, from the point of view of the twin in the rocket, the other guy went for a trip, which is untrue). i suppose the safest way to choose an inertial frame of reference is to claim that both the Sun and the Earth revlove around their centre of mass. But then again, it’s not a two body problem is it?! Omar: I didn’t mean to suggest you had done something wrong with the analysis. I’m sure that’s correct, and fascinating of you to find. I meant looking in the data for whether there are signs of something odd with the fielding of this question, although GSS doesn’t exactly make this easy to do. I have some mixed feelings about GSS/NORC. I guess this darn earth around the sun thing is more interesting than I initially thought…Jeremy’s numbers show a huge gender difference (ASRs and AJSs have been written about much smaller gender disparities) in the proportion Ptolemaic/DK. If you cross tab gender and education, you get an even more bizarre picture. 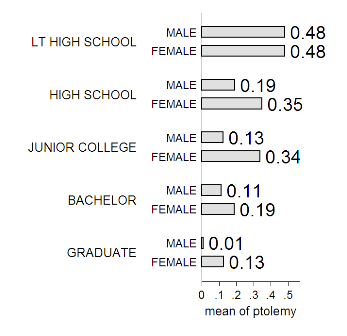 The gender difference appears in high school, and is gigantic at the graduate level (Women: 13%; Men: 1.2%). The two cultures? Do I see a Jeremy/Omar team up in the making? The first ever AJS/ASR written through inter-blog collaboration? Mike Daum » Blog Archive » Heliocentrism in the U.S.
Physics says both answers are actually correct, depending of the frame of reference. The sun and the earth appear to revolve around each other from each others point of view. However the other planets give sufficient data to say that the sun is (approximately) a common rotational point for all planets, when considered from a sun fixed reference frame. Whee. I’m sure an astronomer can correct me on this one, but its all reference frame based. At least from a classical Newtonian perspective. Ok, so I was right about one thing. This whole earth around the sun thing it’s become another snobby excuse to talk about how dumb Americans are, how this explains how we elected Bush, etc. But before you get all high and mighty with your Europhilia, you should look here and see that Americans are actually smarter than Europeans (broadly defined as EU 25; yes, blame Eastern Europe) on this particular question. South Koreans are of course the smarter ones (subtext: turns out that the GSS science module it’s been replicated in several countries, and that a similar module was run in the 2004 Survey of Consumer Attitudes out of the University of Michigan; they came up with the same low 70s number as the GSS, which makes me think that the finding is robust for the U.S.). Another reason to homeschool. Our public school system is not even really teaching facts anymore, but is teaching “politically correct thinking” at the expense of real education. See here for another look at these and related questions (e.g., on evolution) by religion. Physics says both answers are actually correct, depending of the frame of reference. The sun and the earth appear to revolve around each other from each others point of view. Yes, you can construct a reference frame where the entire universe revolves around the Earth… but the point of the Copernican revolution is that doing so doesn’t make much sense! The center of mass of our solar system is clearly inside the sun, and understanding that is the key to understanding the motion of the planets. I have some sympathy with the one tenth of one percent who selected “some other period”. When the Earth revolves about it’s primary, It completes the orbit in 365 days, 5 hours 48 minutes, and 46 seconds. Hence the need for leap years. Except in millennial years. Unless those millennial years are divisible by 400. True. And since the actual system consists of the Sun, all the nine planets, their moons, the astroid belt, and several comets (at least), the orbit isn’t exactly periodic, unlike in a two-body central forces problem. Hence the need for the ocassional leep seconds. The option should have read: “some other period drastically different than 365 days”. Why is this surprising? My experience has been that to ask a protein chemist a quantum chemistry question, you might as well have asked a grad student. Ask them an astronomy question, and a freshman astronomy undergrad or good high school student would do you better. Ask a basic question about a subfield, but one which comes from an unusual perspective, one not part of the field’s research thrust (so mistaken beliefs aren’t pruned), and you get a mixed bag of answers from subfield profs, and trash from out-of-subfield profs. With half the US apparently having a terminal high school degree or less, why is a grade-school view of astronomy surprising? Okay, but I’m a grad student who likes to think I’m pretty smart, and I got the second one wrong… of course when I stop to THINK about it I understand, but that doesn’t mean I answered it right.